Teardrop campers are what I think of as the babies in the world of towable campers because they are small, which makes them ideal for one or two people who want to enjoy camping without having to have a large towing vehicle; who want to use as little extra fuel as possible when pulling their camper; who don't want to spend a lot of time on setup and takedown; are looking for an economical camper, and who don't mind a cozy camper interior. They have a distinctive curved shape to them; much like a teardrop that is tipped on it's side. I have to admit I was pretty skeptical about the practicality of a teardrop camper the first time I saw one because it was so little - only about 4 feet wide and high, about 8 feet long. I thought it was a storage trailer for people to pull behind their campers for all their extra "stuff" that didn't fit into their regular camper and not an actual camper itself. But once I opened the door, saw the bed big enough for two, and the kitchen galley area under the back hatch, I saw how wrong I was . I was impressed. A teardrop camper is a great compact unit for one or two people who want to enjoy the outdoors without spending a fortune on a camper (or on gas). Leftover and salvaged materials from the war became popular building materials for teardrop campers. In some cases, salvaged wheels from the war jeeps found new life as the wheels for teardrop campers. The plane wings from World War II bombers took on a new use as they became the shiny exterior covering of teardrop trailers. Teardrop campers were a camper that was practical, stylish, and aerodynamic before that term became a big buzzword in the automobile manufacturing industry. 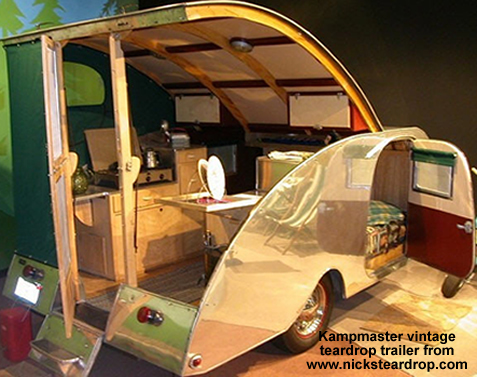 The popularity of teardrop campers continued through the 1950's. Some of their popularity was due to the fact that do-it-yourself people who wanted to build things with their own hands could build their own teardrop camper. The "Popular Mechanics" magazine published teardrop trailer plans in their magazine which many people used to build their own. Commercially manufactured models were available from many small companies as well as by Airstream, one of today's leading manufacturers of camping trailers and RV's. The teardrop camper's popularity started to dwindle after the 1950's as people started wanted campers that were "bigger and better." By the mid-1970's, there were very few manufacturers of teardrop trailers left. And even though today there still only a few manufacturers currently making teardrop trailers, there is a resurgence in their popularity, with vintage and restored teardrop campers garnering the most interest and attention. If you are interested in owning a teardrop camper, you have four basic options. You can buy a new one, buy a used one, purchase a vintage one that has either been restored or is in need of restoration that you do yourself or hire someone else to do, or you can build your own from scratch. Because most manufacturers of teardrop trailer today are small companies who custom build each camping trailer for their customers, don't expect to walk into most any local RV dealership and see a display of teardrop campers. Even large camping and recreational vehicle shows don't regularly have teardrop campers on display. I went to camping shows for several years before I saw one. 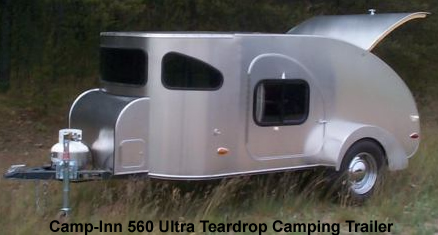 While a new teardrop trailer won't have the vintage charm of a restored one from the 1940's and 1950's, they will still have that unique teardrop shape and will have modern amenities. For example the 560 Ultra model from Camp-Inn Trailers has a couch, queen sleeping area, halogen lights, ac outlets, stainless sink and countertop, propane tank on the tongues, birch kitchen cabinets, an all birch interior, fold-up hitch jack, and all aluminum exterior. Below is a list of teardrop camping trailer manufacturers (probably not all-inclusive but as complete as I could make it). Many of these manufacturers either custom build the campers as they are ordered or build them in limited manufacturing runs based on customer demand which means there is typically a several week or even several month wait for a completed trailer. Some companies offer a range of available models with many upgrades and options to choose from; while others custom build each trailer to customer specifications. Teardrop Fix-It Ship in Victor, Montana has just about everything a teardrop trailer enthusiast could want including teardrop parts, teardrop kits, and already built teardrop trailers including exact replicas of the KIT and Kenskill Teardrop Trailers from the 1940's. Tadpole Trailers Tadpole Trailers manufactures the "Tadpole Trailer" - a modern version of the teardrop trailer. Compact, very lightweight and affordable! Brand new, a base model is totally within reach for the compact car owner, and those Baby Boomers who love the simplicity of tent camping, but just can't sleep on that hard ground anymore! (website: http://www.tadpoletrailers.com/) We recently did a feature on them in the blog - read more about Tadpole teardrop trailers. When looking at used teardrop trailers, you may be looking at a vintage model that has been restored, a newer but used replica based on one of the models from the 1940's and 1950's, or an older model that is in need of repair and restoration. More information on vintage teardrop trailers and restorations is in the next section. Used and gently used newer models of teardrop trailers can be hard to find. It seems that once a person buys one, they are reluctant to part with it. The best places to check are manufacturers and retailers of new models. They may have some used models that were traded in available for re-sale or may accept used trailers on consignment to sell. Of course, classified ads are another place to check but you may be looking for a long time to find just one for sale in your area. Your local RV dealer isn't likely to have any used teardrop trailers in stock; all teardrop trailer manufacturers and dealers in the United States that I know of are smaller companies and don't have nationwide distributors/dealers (although most will work with you to figure out a delivery method if you live far from where the trailer is being made). A little online searching could pay off with a good find. Try typing "used teardrop camper" or "used teardrop trailer" into your search engine, including the state or area you live in to see what might be available in your area. 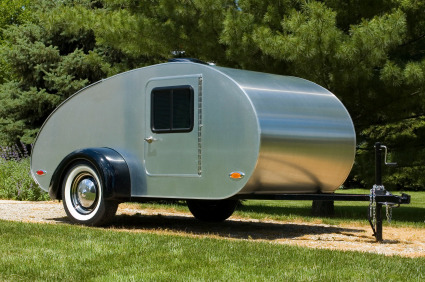 If you are unable to find a used teardrop trailer, you may want to consider purchasing a new one. If that is out of your budget, consider building one yourself. Plans are relatively inexpensive and sometimes free, and there are many online resources for parts you will need. What is a vintage teardrop camping trailer? I guess some people would say it's an old teardrop camping trailer and they would be right. Usually anything more than 30 years old is considered vintage although I would consider a teardrop trailer made in the 1980's to be vintage because one that old is likely to need some restoration work. Teardrop camping trailers were the most popular in the 1940's and 1950's which makes the trailers from those two decades the most popular. If you think you want to purchase and restore a teardrop camper yourself, it can be a fun and rewarding task but don't think it's going to save you tons of money because it probably won't. Teardrop restoration projects are typically called "Operation Dry Rot" because the aluminum skins are notorious for hiding extensive dry rot damage. So, while you may find an old teardrop camper for about a $1,000, restoration costs can easily add up to thousands more. But, don't be discouraged. Almost everyone who has taken on a restoration project has been very happy with their restored camper, but the one thing people say more than any other is that it cost them more than they thought it would. For one person's teardrop trailer restoration story, click here. There's even a list of all the expenses incurred during the restoration. The trailer was originally built from a kit purchased out of the 1947 Popular Mechanics magazine. Because teardrop trailers can be hard to find and because a new custom built model can cost over $10,000, many people prefer to build their own teardrop camping trailer. Popular Mechanics magazine published teardrop trailer plans in the 1940's. A website named Tiny Tears has scanned pages of teardrop trailer plans in old magazine including Popular Mechanics. Whether you decide to buy new, buy used, build, or restore a teardrop camper, it will likely mean lots of fun as you take your camper on outdoor adventures. And because you won't need to purchase a separate towing vehicle or spend hundreds of extra dollars on gas towing one since they very light (especially when compared to most 5th wheels), you will be able to go on more adventures. With a teardrop camper you can spend lots of time enjoying the great outdoors, but then getting away from the elements and hard ground when it's time to sleep by getting cozy in the sleeping area of your teardrop camper. It's the best of both worlds.